Convert to and from numbers and ASCII. Is there a better alternative to Alchemist? Is Alchemist really the best app in Developer Tools category? Will Alchemist work good on macOS 10.13.4? 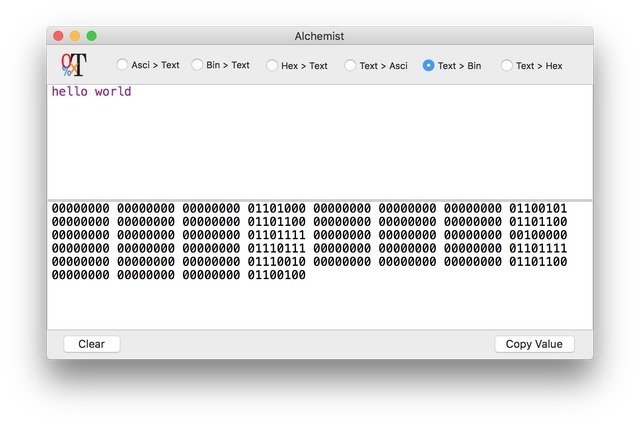 Alchemist is a text converter for ASCII, binary, and hex numbers. It will convert both to and from numbers and ASCII-encoded text. Alchemist needs a rating. Be the first to rate this app and get the discussion started! The Hex > Text function will now accept the text from Apple's XProtect.plist and display it with all hex strings converted to plain text. The 'Extract' button that appears when this function is exercised will display each threat name along with the converted hex strings. A count of the number of threats defined in the plist appears at the bottom of the window when the 'Extract' button is clicked. Both the input and output fields can now do incremental finds. The input field can also do text replacements.